"Many of these ingredients can be found in Asian or specialty shops. Chili paste with soy bean oil comes in small jars and can be found in most Asian markets. Galangal, a member of the ginger family, is a knobby root that tastes like a cross between ginger and pepper. 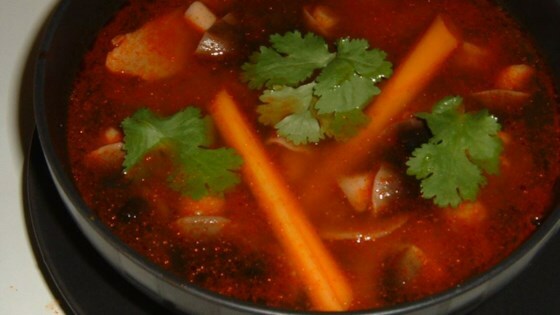 Tom Yum Soup paste can be found in Asian shops, or you can use Thai Red Curry paste. Kaffir lime leaves have an aromatic citrus-like smell and flavor. Garnish with fresh coriander leaves." Trim lemongrass and cut into matchstick size pieces. To make stock: Add the shrimp heads and shells to water, then cook for 20 minutes. Turn the fire off. Soak the heads and shells for further 20 minutes before discarding. Add stock, lemon grass, kaffir lime leaves, galangal, chili padi, fish sauce, lime juice, sugar, and chili paste to a pot and bring to a boil. After boiling for 5 minutes, add shrimps and both mushrooms. Cook for further 10 minutes. Garnish with coriander leaves. My family and I must not like this type of soup, because this was way too spicy (and we love spicy). Just made this tonight. My hubby and I loved it. Just like in Tai restaurants. Make sure you leave the soup to simmer to get the flavour out of the spices.